So my Elizabeth is quite the "Sassy Lassy" these days. She's become your typical three year old and then some. I'm being given quite the run for my money with her! A few weeks ago she was hamming it up for me and I snapped a few pictures. 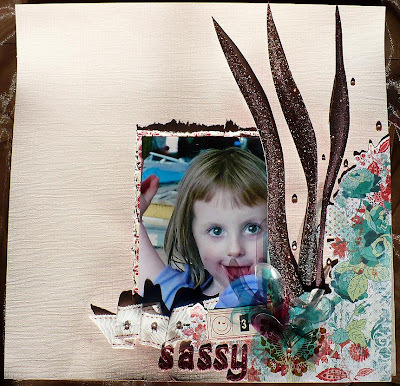 I sat down yesterday with her and created this layout using the November girl kit from Scrap for a Cure. Love this Kit!! Here is a close up of the 3D transparent butterfly embellishment area. I used my heat tool to soften them up and them scrunched them. It was hot to do, but fun! Quite textural too. Wow, this LO is so pretty! Say this 10 times fast..
A Red and Cream Rolled Wreath! 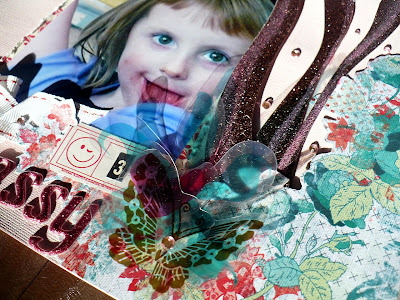 A few of my newer "Me" LOs..
My vintage inspired altered Trinket Box project.